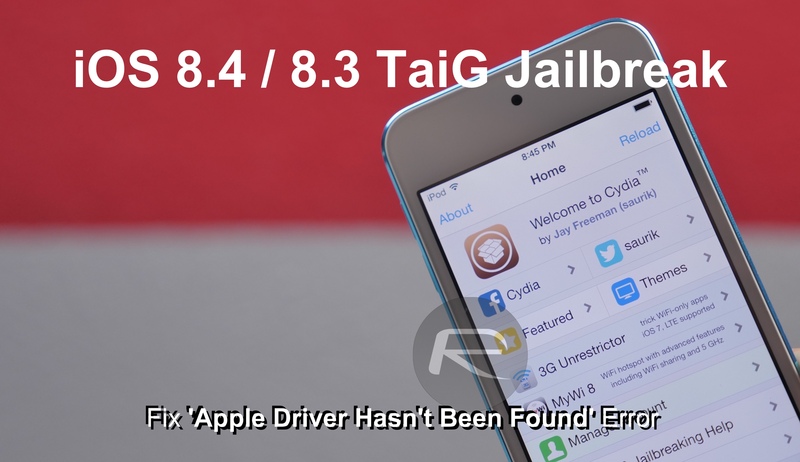 If you are getting ‘Apple driver hasn’t been found’ error when trying to jailbreak iOS 8.4/8.3 with TaiG, it is likely that you are on 64bit version of Windows and need 64bit driver installed for iTunes. Yes TaiG 2.1.3 and 2.2.0 works on the latest version of iTunes and doesn’t need you to downgrade to iTunes 12.0.1, but 64bit Windows users might still get this dreaded error, as can be seen in the screenshot below, when trying to jailbreak using TaiG. Apple driver hasn’t been found. Please download and install iTunes. Step 1: First make sure you have 64bit variant of latest iTunes version installed on your computer. You can download the latest version of iTunes for Windows directly from Apple here. Step 2: Download this 64bit iTunes driver iTunesDriver64_0205.exe for Windows from here and install it on your computer. Step 4: Launch TaiG and jailbreak your device. You shouldn’t get ‘Apple driver hasn’t been found’ error now. If you are encountering any other issue during or after iOS 8.4/8.3 jailbreak with TaiG, check out our troubleshooting guide here: Fix TaiG iOS 8.4/8.3 Jailbreak Stuck At 20% Error 1101, 1102, 1103 And More [Troubleshooting Guide]. Has this solution fixed the issue for you? or are you still getting this error? Let us know about it in the comments section below. Everything on my browser and computer thinks the driver is a virus so no way. Even the company behind the installer is a Japanese name, not trusting this. I’m getting “Apple driver anomaly. Please check [link that doesnt work]” error. Did this fix and still not working… Any suggestions? I have the newest TaiG version, the newest iTunes, and the driver from the link above and I still receive the driver not found error. I have re-downloaded everything at least 5 times hoping it would resolve and have ZERO luck. This Worked. You don’t have to extract the file either so you cant get a virus. Practically, it’s opening the file and executing it that gives you a virus, if it was one. Having or not having it in a zip file makes no difference, as you cannot normally get a virus from not executing it. Well, maybe you can and I’m just stupid, but as far as I know, viruses must be executed in some way or another. It’s just a guess. I downloaded this file before and I extracted it and then executed it and it gave me a virus. But I didn’t this time. Maybe not extracting it isn’t there’s so. I don’t know. SAME. Did you ever get it to work??? The MEGA link doesn’t work anymore! !please help!!!!! Please update the Mega link! It doesn’t work anymore! Badly need the file! Thank you so much!!! Please, please, PLEASE fix the Mega link!!!!! Yep, link is dead. 🙁 Getting the error and don’t see a fix. Did you find a good download anywhere??? the link has been fixed now. please try to download again. should work. fixed the link. try again. broken link has been fixed. i have fixed it. please try again. If any of you AT&T users is not able wanting to ՍΝᏞΟᏟΚing AT&T devices, you can have a style at just google atttiphoneeuunloockiing, it’s one of many few sites that’s still able to սոⅼοсking AT&T phones after AT&T had its database renewed, which denied the access with their database for all sites make use of to obviously have the access. Many thanks! The driver got me past that cursed error! apple driver locks up while “seeking”…? None of this works for me. The iTunes driver 64 says its not compatible with my computer. 1 month ago i did the jailbreak in a 5S with ios 8.4, and to do so, i had to download the itunes drivers for windiws 64-bit and everything went ok. Few days later i realized that when i plug the iphone into my computer itunes does not recognize it anymore. I already updated the itunes to thr last version and nothing. Any idea? How did you delete the driver? I think my problem with itunes after doing the jaikbreak comes from that driver, that substitute the Apple oficial and itunes does not recognize the iphone! Have the same issue, but windows does recognize the iphone, itunes does not! !